Just as Jeremy Corbyn was on the ropes this week over his woefully inadequate response to the anti-Semitism row engulfing Labour, he received an unexpected message of support. It came in the form of a carefully co-ordinated intervention from an impressive sounding list of 42 academics. 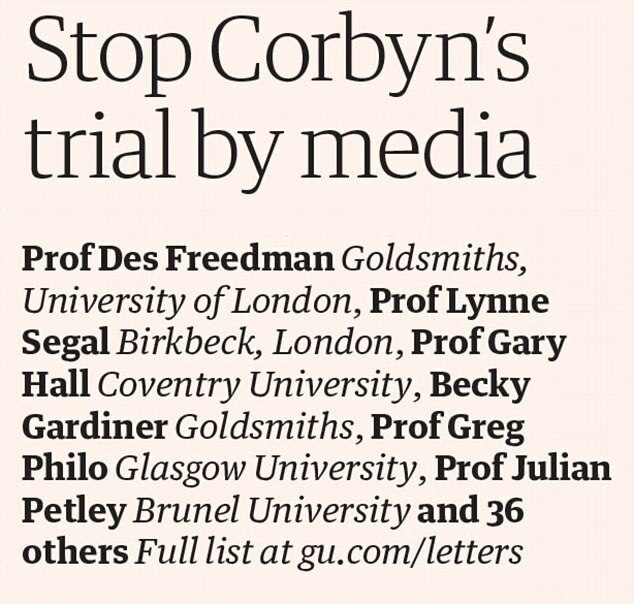 In a letter published in the Guardian (where else), the academics leapt to his defence, claiming he was being subjected to an ‘unfair trial by the media’. And these were not any old dons, according to the Guardian, they were ‘senior academics’. So who are these intellectual heavyweights, and why did they merit such prominent coverage in the Guardian? The paper published the letter the day after Corbyn provocatively attended a supper in London with a Left-wing, anti-Zionist group where some of the central tenets of the Jewish faith were mocked and where a poem that abused the Queen and Prince Philip was circulated. Warming to her theme, she boasts: ‘I have devised a third-year undergraduate module entitled ‘Zombie Apocalyse: the rise in zombie culture’. Now in its sixth year it is currently the only academic [zombie] course in the UK.’ There’s a surprise! A paper on her website is entitled: ‘Rocking with the undead: how zombies infected the psychobilly subculture.’ Ms Dipple goes on to tell us: ‘Zombie culture is ubiquitous: the undead can be found lurking in a number of unexpected areas of popular culture.’ Some might joke that one or two zombies can be found in Corbyn’s Labour Party. Another signatory is William Proctor from Bournemouth University, where he is a ‘senior lecturer in journalism, English and communication’. His academic achievements are listed online. ‘He has published on a variety of topics including Batman, James Bond, Spider-Man, The Walking Dead, One Direction fandom, and the reboot phenomenon [whatever that means] in popular culture. ‘William is Director of The World Star Wars Project, a five-year study of the franchise from multiple perspectives which will culminate in 2020 with a multilingual, mixed methods global online questionnaire. Then, from York University, comes Jonathan Eato, a music lecturer whose credits include taking part in an international music prize in Luxembourg. He reached the final in 2004 with composition titled Bling Bling Balaam and tells us that two years later, in a revised form, the work was broadcast on Danish radio. Bournemouth University is also represented by Dr Peri Bradley, a media studies lecturer who earned her doctorate in film at Southampton University. Her academic interests are centred on the way the human body is represented in literature, art, film and TV. Another ‘top academic’ is Allan Moore, a graduate from Southampton University who is now the professor of music in the school of arts in the city. He has also written a book on the 70-year-old rock musician Ian Anderson of Jethro Tull – or more specifically on the ageing rocker’s 1971 album Aqualung. ‘Moore tackles the album on a track-by-track basis, looking at the lyrics and studying the complex structures and arrangements of these classic songs,’ we are told. Southampton University features again in the form of Seth Giddings, the Associate Professor of Digital Culture and Design. He describes himself as a ‘media and cultural theorist who specialises in research on playful media, from videogames and social media to activist and art projects’. Then there is Ruth Catlow who is not even connected to an academic institution but is listed as a director of Furtherfield, an ‘artist led online community’. With a degree in sculpture, Ms Catlow describes herself as an ‘artist, theorist, curator,’ and a ‘recovering web-utopian’, whatever that is. Meanwhile, Zeta Kolokythopoulu, who is listed by the Guardian as being at London South Bank University, is not known there as a member of its staff. A separate website suggests she may be a PhD student. There will have been little surprise at the pro-Corbyn views advanced by another individual who put his name to the letter: Jeremy Gilbert, the professor of cultural and political theory at East London University. In his biography, Gilbert boasts he writes regularly for the Guardian as well as the Left-leaning New Statesman, and that he has appeared on national TV ‘as a spokesperson for Jeremy Corbyn’s leadership of the Labour Party’. In its news coverage of the letter, the Guardian skated over that admission as well as the fact he is a ‘member of the founding national committee of Momentum’, the group set up in 2015 to shore-up Corbyn’s leadership of Labour. The shadow chancellor John McDonnell, a self-confessed Marxist, will have been delighted by the inclusion of Theodore Koulouris on the list. Another of the letter’s authors, Michael Chanan, professor of film at Roehampton University, is proud to state he is the ‘New Statesman magazine’s first video blogger’. Hacked Off, the lobbyist group seeking to muzzle the Press, is inevitably involved. Julian Petley, Professor of Journalism at Brunel University, a supporter of the group, signed the letter. A member of the editorial board of the British Journalism Review which over the years has been hijacked by the Left, he has been a full-time academic for 26 years. None of these academics is from Oxford or Cambridge. In fact only one of them, Bart Cammaerts of the London School of Economics, comes from one of our top ten universities. And he is an associate professor in the Department of Media and Communications who is currently on sabbatical. There are several signatories from Goldsmiths, University of London, and the less well-known universities of Aston and Lincoln. So why has the Labour-supporting Guardian exaggerated their status? Could it be down to the influence of Corbyn’s all-powerful communications chief Seumas Milne? He is a former columnist on the newspaper. He also happens to be an old colleague of Becky Gardiner, who signed the letter in her capacity as senior lecturer in media and communications at Goldsmiths University. What the letter did not make clear is that she worked for 14 years on the newspaper and was comment editor when Milne was a columnist between 2010 and 2014.